You don't need to travel all the way up to the North Pole to enjoy this cute little penguin cartoon. In fact, you just need to open your vector software, try to reproduce the illustration below and follow all the steps of this simple drawing lesson. That's should do it! This tutorial is rather easy to complete. The cartoon animal involved is pretty basic and doesn't require the creation of complex shapes. Also, shadows are simple and very easy to apply. So if you are not 100% familiar with vector drawing or don't want to create a complex animal, then this drawing lesson is definitely for you! First, draw all the outlines of the character using thin black lines. Then, fill all the shapes with plain colors. Since the character is mostly colored in black, the drawing can be harder to read for now. 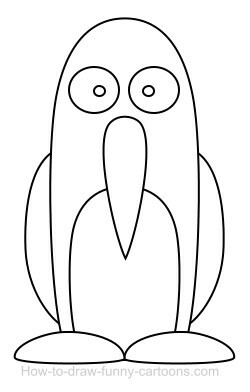 Once you are finished, select the eyes, the beak and the white spot on the stomach. Take your gradient tool and apply some nice shadows on these parts. You can use a circular fill for the eyes. For the other shapes, just make sure that the bottom of each shape is darker. Next, work on the eyes of your penguin cartoon. Create three circles for each eye. One will be used to create reflection on the pupil. The second circle will be used to create reflection on the eye itself. Finally, the third circle can be placed behind the eye. It won't be visible for now, but you'll see why we need this shape in the next step. It's now time to add a few lights shadows on the body of the penguin. Create a duplicate of the body and color this new shape in white. Use transparency to hide the bottom part. 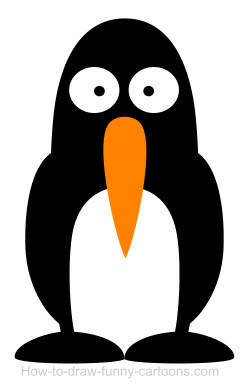 You should see the black circles that were placed behind the eyes in the previous step. You can also create small shadows on the white spot to increase the visibility of the feet and the beak. Finally, create white shapes on the beak, the wings and the feet. Once again, use transparency to hide the bottom of these new shapes. Great! 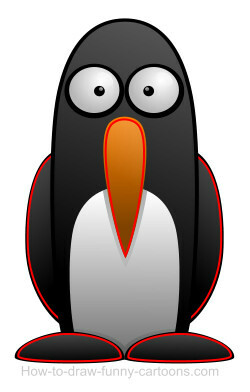 Your penguin cartoon should be done by now! As you can see, this drawing lesson is quite easy to achieve after all.